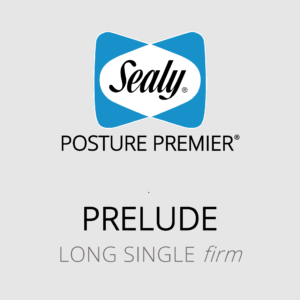 The Sealy Posture Premier (Prelude) long single mattress with firm feel is the entry point into the Sealy range. Featuring Sealy Foam, PostureTech ST springs and EdgeGaurd® Edge Support. The Sealy Posture Premier (Prelude) queen mattress with firm feel is the entry point into the Sealy range. Featuring Sealy Foam, PostureTech ST springs and EdgeGaurd® Edge Support. The Sealy Posture Premier (Prelude) double mattress with firm feel is the entry point into the Sealy range. Featuring Sealy Foam, PostureTech ST springs and EdgeGaurd® Edge Support. The Sealy Posture Premier (Prelude) king mattress with firm feel is the entry point into the Sealy range. Featuring Sealy Foam, PostureTech ST springs and EdgeGaurd® Edge Support.